Quiche is guiding me to the Dwarf shop while being amazed by my herculean strength. Anyhow, we are passing many side roads and Small alleys. While we walk I memorize the way and houses. Before long, the blacksmith district comes into view. A new long sword and spear shaft are leaning against a rack. A mannequin is set up with steel armor attached. This store probably serves as both a blacksmith and a shop. A full-scale black smith is next door. A worker with a strong physique is stepping on a bellows, dripping with sweat as he works. The heat is so strong that it is making us feel hot. Of course, there is an anvil near the furnace too. With a human and dwarf craftsmen wielding a hammer, the ringing sound of beaten steel sounds out. Rather than a smith, on the other side a brick making workshop spreads out. With approximately five buildings lined up, multiple workers are using straw, water, and clay to make bricks from scratch. There are also dried bricks to be collected in the area. This area has various craftsman including blacksmiths. Quiche stops in front of a shop before a corner on the street. The beautiful Quiche directs her green eyes to the workshop, and as she talks a dwarf appears from within the workshop she is explaining. He has a smile on his perfectly round face. The smiling dwarf runs up to us. “Eh? Enchanting?” Unintentionally, I parrot him. Rollo reacts to the strange dwarf from my shoulder. Rollo gets hops down from my shoulder and approaches this strange Dwarf seeming to be curious, while crying out. The kappa headed dwarf calls out enchanting repeatedly to Rollo. A strange conversation is started with Rollo. I turn to Quiche to ask for help, but she is turning her beautiful and peaceful feminine smile to the kappa dwarf. The kappa headed dwarf seems to be named Bon. Probably because of the poncho he is wearing covers him completely from head to toe he looks even more round. Bon-kun leaves with the strange word “enchanting” and runs back to the shop. 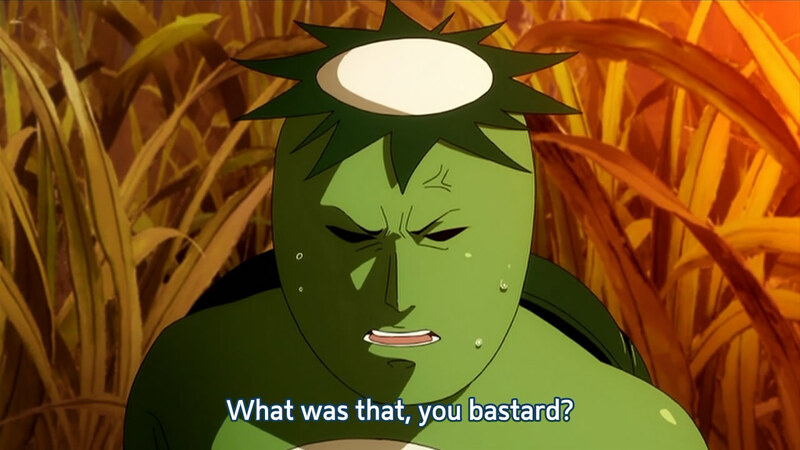 Meanwhile, the kappa headed Bon-kun returns. They brought with them a stern faced dwarf who seems to be the store owner. The is a large wrinkle in the outer corner of his eye that connects to his plump cheeks. His eyes convey a peculiar sternness. Unlike Bon, the ruddy bridge of his nose is thick and his nostrils are large. It could be said it was contrasting since their clothes and hair styles are so different. As I though, this hard-faced looking dwarf-san has the same name as the shop, Zaga-san. A tunic is wrapped around his stern shoulders. He also wears a leather belt spotted with silver that is wound around his waist and smithing tools like hammers hang from the belt. He gives of the aura of a craftsman. Having been introduce by Quiche, I bow slightly to Zaga. I show the dwarf Zaga-san to carapace. Joking? But Zaga-san has a straight face. So, I will also respond with a straight face. A joke. Zaga easily lifts the carapace with a brawny arm. He begins to look over it, staring. Since he is smiling he seems to be pleased. Being chastised by Zaga, Bon looks down. Muttering weakly. He then shrinks back to his round form. Bon-kun seems disappointed and looks to be even smaller because he is hunched over. Zaga talks about Bon with a calming voice as he looks at him with tender eyes. Zaga then looks at Bon proudly. There are magic enchanting specialists too? The person himself does not seem to understand. He is smiling, seeming to enjoy being praised by Zaga. …He looks at happy Bon-kun again. The long eyelashes of his large blue eyes have a hint of gray. With the plump frame, unique to a dwarf, I am reminded of a cute /bear-san/ doll by the rotund face. However, he possesses an amazing talent. The bear cub’s gift is some concealed magic. Noticing my gaze, Bon-kun extends his arms out in a two-fisted victory pose. I return a smile. Disregarding that, Zaga begins to talk. Zaga places the heavy carapace over the tunic on his shoulder and begins to walk. Quiche asks me from the side. The dwarf Zaga goes into the shop with the heavy carapace over his shoulder. Bon follows behind Zaga and Quiche follows me as well. Inside the dwarf’s shop there is a large desk, furnace, bellows and an anvil. It reminds me of Achille-shisho’s workshop. As I look at the workshop, Zaga places the armored commander ant’s carapace on top of the wide oak desk and removes a black cloth. He removes a quill pen from his chest and holds it in one hand. He seems to be taking notes on the cloth. He writes on the cloth by scratching with the quill pen. Zaga causes me to remember the mark on my left hand. Zaga draws a rough picture and puts the sketch down. The drawing is surprisingly good; he could even pass for an artist. Zaga brings out a small chair for me to stand on as he measures my body and takes notes. I ask while I am being measured. Zaga’s face looks tense with all its wrinkles, so I am very conscious and I’m sure to use honorifics. Hearing Zaga’s words, I remember the blue and white tiger hide. I take out the bluish-white fur. I hand Zaga the pelt. Zaga shows the fur I handed him and gave it to Bon. Zaga’s face become gentle when he sees Bon’s smile. I have a frightening impression of Zaga because of his severe expression, but he loves his younger brother. Zaga returns his eyes to me. His expression has returned to being stern. I have no understand of the market price, but I can trust this Zaga. It is strange, but I feel like this in not my first time meeting him. This guy and I may have an uncanny relationship. Zaga has already begun meddling with the carapace. He is absorbed in the material and just says “Ou” to me without looking. Rollo says goodbye to Bon-kun. With a smile covering his whole face, Bon-kun begins a strange conversation with Rollo. If we keep making noise here we will probably interfere with the work. Called by me, Rollo jumps onto my shoulder. Quiche has been quiet this whole time. Bon puts on a lonely face and shakes his hands side to side. I think it is mostly for Rollo, but he is seeing us off. Quiche and I leave the shop of the dwarf brothers and walk into the street. I walk next to the beautiful elf, Quiche. Her smiling face is beautiful. Despite that, her disposition is handsome. I briefly give her my thanks. Quiche’s expression hints at happiness, before returning to an attentive appearance. Rollo cries out with her rumbling throat voice. She moves her tail flutteringly as she earnestly sends a signal to Quiche. Rollo seems happy about Quiche’s praises, ahem. She raises her face and arches her back to display her fluffy neck, lifts one leg to show a paw pad and lightly claps my shoulder. As we walk while having such a pleasant conversation I sense a magic essence following behind us at fixed distance. Just replace “Enchanting” with “Enchantment” and you’ve got sandal from dragon age. Feel like a blatant rip off to me. It was more likely based off of that. Dragon age is a good game so I have no problem with it. Plus a lot of people pull ideas from books or things they read and put it in their own writings (after changing it somewhat). Honestly glad I was not the only person who saw the comparison. I was thinking the same thing Enchantment? ENCHANTMENT! I agree. I was thinking the same thing the entire time I read this chapter. Thanks for the TL, chaps. … This… is a Dragon Age reference, right? It can’t be anything but that, right? But birdy is sleeping and I am tired :(! Thank for the chapter hmmm hmm who could this stalker be the first legit wife or the girl with angry eyes ?? I’m confuse who is the First Legit wife? the Assassin? or don’t tell me…..The Loli from his master’s house? And who is the girl with angry eyes? That doesn’t count you know? He was staring at the demi-human cat right? But that ended there. Besides the legal wife is yui the mistress? Did i spell that right? Are the water spirit, the daughter, and some others. 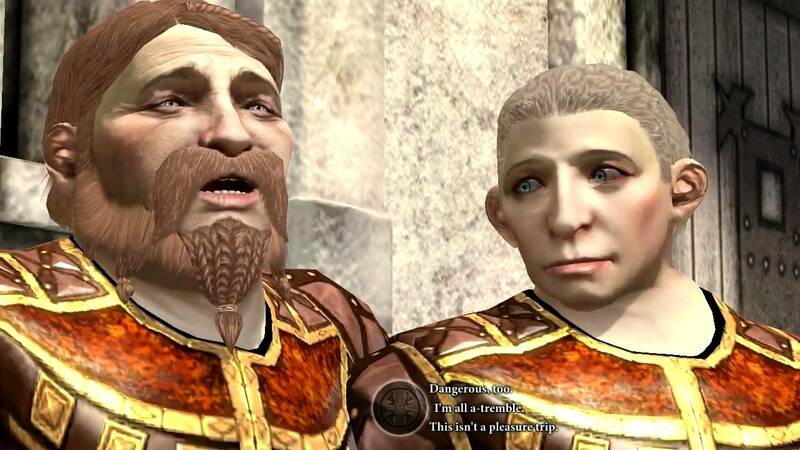 i had a friend replaying Dragon age origins a few days ago so i linked him this for that reason,he called me like an hour later and just screamed enchantment into the phone really loud then ended the call. I wonder how long until Quiche joins the harem. Along with the other elf. For that matter, I wonder how long until the harem is actually formed (the females made his vampire bride partners). Totally a dragon age reference. Thanks for the chapter Birdy! Seems like that other girl totally has interest in him.